Lone Survivor is a work of unique filmmaking, and tells a true story born of the harrowing perseverance and teamwork of the nation's most reticent heroes. The concentration of emotion and passion born out of Operation Redwings resides daily in the hearts and minds of the family and friends who survive the fallen. For the families and teammates impacted by the operation, and the survivor, the film is the memorializing end to the story that it tells. It is told to inter the honor and sacrifice of Marcus' Teammates in the nation's consciousness. Peter Berg fulfilled Marcus' resolve to realize the film on his rigorous terms. This was nearly a bridge too far. A truly herculean effort was made by the production team at Film44 to make Marcus’ mission a reality. The entire crew labored to breathe at 13,000 ft atop Ski Santa Fe, burdened with enough equipment to make even the most seasoned Frogman cringe. The actors were conditioned not only in SEAL culture, but also in the brutality of SEAL training. From the perspective of a technical adviser, it is the first film I’ve seen that walks that blurry line separating reality from entertainment perfectly. Full credit goes to Pete in understanding his audience. Consumers don’t go to movies to see the reality of war. With troubling detail, war is available through any cursory web search of conflict zones. War is miserable and ugly, and not worth $15.00 to see in a theater. But a film that renders heroism juxtaposed with the brutality of war can illustrate the true honor of sacrifice. That’s entirely different and something worth paying for. And so it was with my experience on Lone Survivor, watching a constant tug of war between the authentic and the produced, refereed by Pete Berg. I was able to observe those thorny decisions of what to include in the film, versus those parts of the story that were simply too real to be told. Pete balanced tolerance for the horrific reality of war with the heroism that filmgoers desperately want to see; a difficult endeavor with an audience already privy to the tragic and triumphant outcome of the film. I was honored to be a part of some of these decisions, and in my own way offered my reality of war so that Pete could balance that with his vision for the film. It was a learning experience, most of all for me, and one I wouldn’t give up for anything. Enthusiastic willingness to push their individual limits came from Ben Foster, Emile Hirsch, Taylor Kitsch and Mark Wahlberg, each willing to spend their time and energy training with the team of Frogmen that Film44 brought in to teach and advise. Cuts, bruises and sore muscles were par for the course. Months prior to filming, they each went through a rigorous physical training program to just prepare themselves for the more demanding training we would later provide. We began with a solid week of live-fire work at the Albuquerque PD SWAT facility, creating an environment that placed safety at the apex of our mission set, with training value a close second. With generous support from Under Armor, Blackhills, and Tango Down we ran through nearly 30,000 rounds of 5.56mm. Each actor trained with the same weapon they would eventually use throughout the film (minus the blank-firing-adapter of course). For both cost and safety reasons, live-fire training is not something I recommend for most films, however it was necessary here per Marcus and Pete’s request. Both were adamant in their belief that the actors’ performance would be false without the experience, and that was simply unacceptable. This truth was realized later on set; not one blank round was fired during filming by any of the actors without an established sight picture—the hallmark of a professional gunfighter. Photo: Lone Survivor stars Taylor Kitsch, Mark Walhberg, Ben Foster, and Emile Hirsch. After countless positional shooting drills, magazine changes, point- man and stress courses, we switched out the bolts, loaded up training munitions and moved to the Chilili Land Grant to begin basic sniper and special reconnaissance training, as well as small unit tactics and maneuver warfare. From the beginning, this film was viewed as a period piece; the tactics we taught reflect Naval Special Warfare Land Warfare circa 2004- 2005. With a dozen role-players armed with blank-firing AK47s and 200 acres at our disposal, we trained the actors on how to use cover and concealment, read terrain, and patrol and fight as a Team would. We didn’t involve ourselves in their method, we simply taught them how to fight. Pete: I need you to move from this rock back to this wood-line. Ben: I would never expose myself like that, I’d give up our flank. Pete: OK fine, where would you go? Ben: Nowhere until Luttrell starts sending rounds down range....shoot, move and communicate...you know? That’s not an actor acting, that’s a thinking shooter. 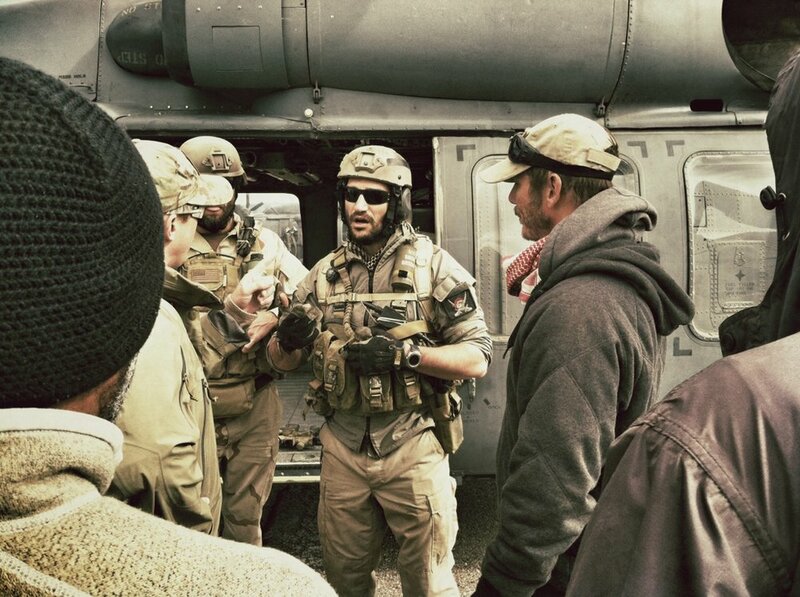 The filming of Lone Survivor was far and away the most emotionally charged set I’ve ever stepped foot on. From my perspective, the effort put forth by the cast and crew was nothing short of monumental. Film44’s dedication to Marcus’ story, the fallen Teammates, and those who survived the fallen was inspiring in an industry that at times falls short from a veterans’ view. I haven’t been as proud to be a part of anything since I left the SEAL Teams. Mark left the SEAL Teams in 2009 after a 12 year career in the Navy. Based in Los Angeles, he works in the entertainment industry as both an actor and stuntman, as well as a technical advisor. He has guest starred on TNTs Major Crimes, and was most recently featured in the film Captain Philips. He is also currently attending UCLA where he studies Classics.